What is the best thing on a chilly weekend for dinner? Anything slow roasted in the oven, making your whole house smell delicious and keeping you free to do other housework (ahemm, or watch old movies). So yesterday I wanted to slow roast a chicken, and I wanted an herb rub that was a little different than my typical lemon and garlic go-to. So I went to Pinterest for inspiration and found a great recipe posted by blog that I really enjoyed, and will continue to visit, called The Bitten Word. Their purpose is to cook religiously from all their food magazines they get, complete with notes and commentary. They posted a chicken recipe originally authored by Bon Appetit. 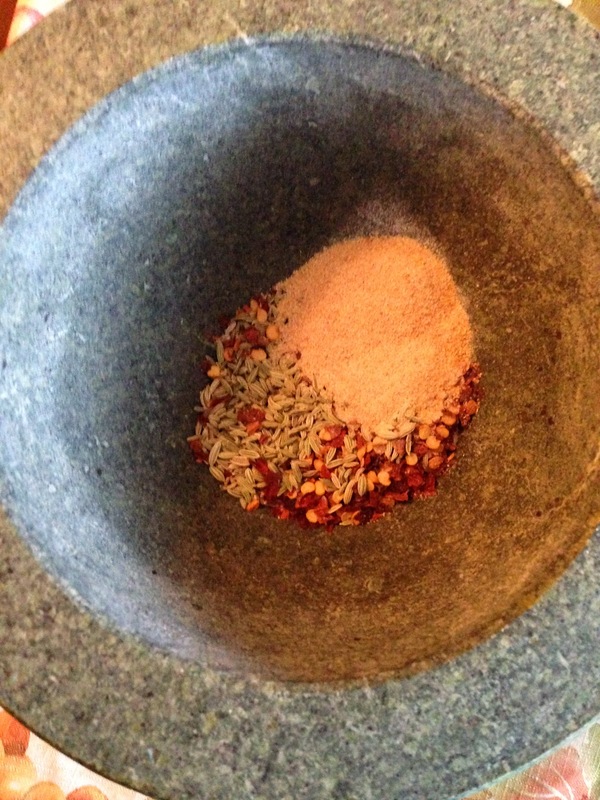 I found the herb rub of red pepper flakes, fennel seeds and marjoram very intriguing. Marjoram is the milder, sweeter cousin of oregano, and isn't used very often. Fennel has an anise flavor that's usually found in Asian dishes. But I changed a few things. I used a pyrex pan, because I liked the higher pan sides to gather more juice for a gravy and so I wouldn't lose any potatoes overboard. 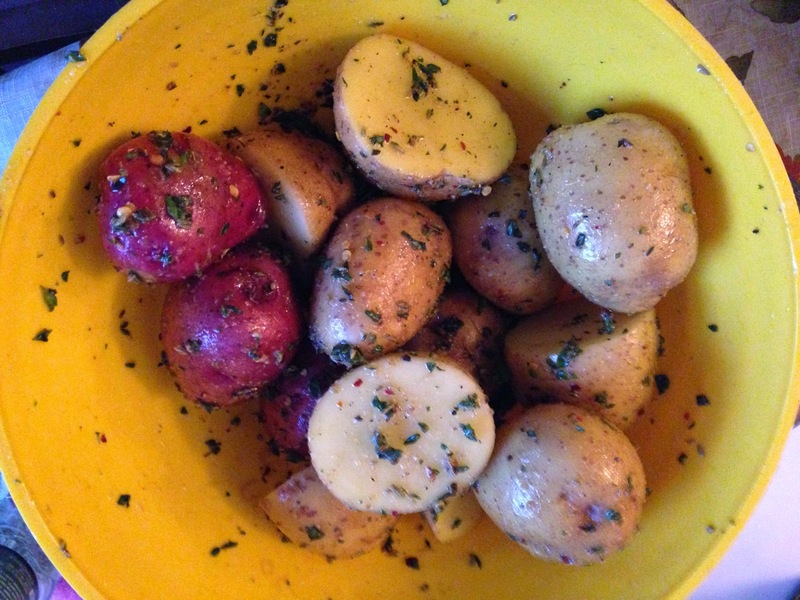 I added garlic, and I doubled the herb rub and rubbed the potatoes, too. 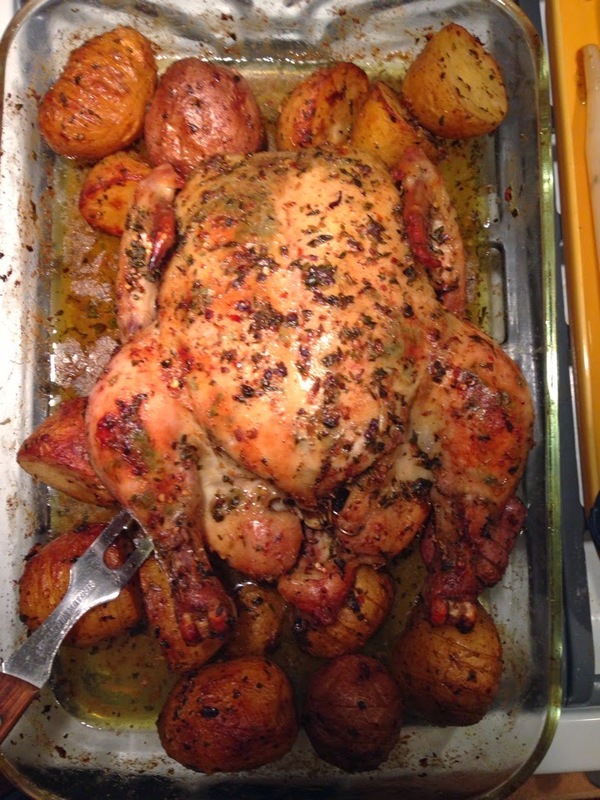 I also brined the chicken, and I baked the chicken on a slightly higher temperature and on convection roast. This sped up cooking slightly, so depending on your oven, you need to keep a close eye on the chicken the last hour, and you may need to cook it at my higher temp or the lower 300˚. This baby takes 2 1/2-3 hour, depending. First hour, I roasted the chicken breast side up. Then I flipped it in hour 2, then flipped it back up the final hour. This is a trick I do for my chickens and turkeys. It keeps the breast meat very moist. Baste throughout, and reserve the juice. All that yummy makes a delicious gravy. Sunday dinner is calling my friends. Get your roast on! Take the organ meat packet out of the cavity of the chicken and discard. Rinse the chicken. In a large bowl, dissolve the salt and sugar in the cold water. 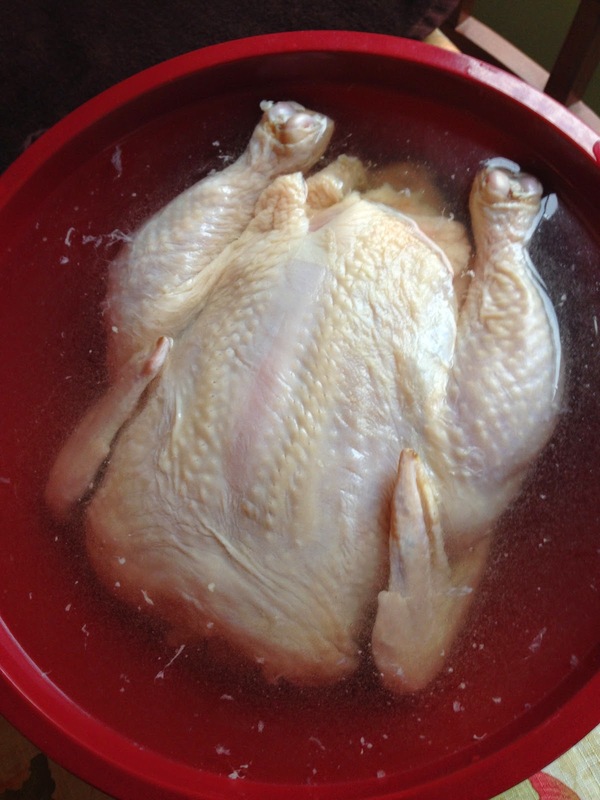 Place the chicken in the bowl and let brine for an hour. 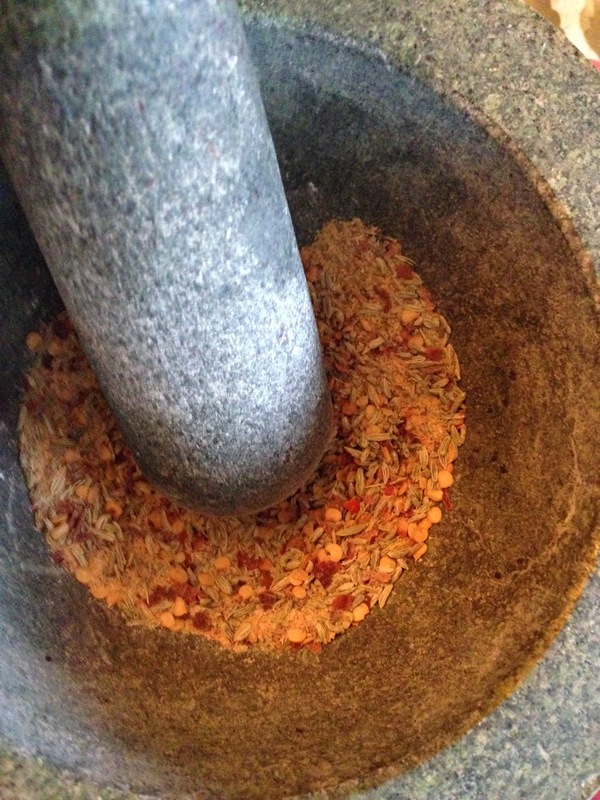 Meanwhile, in a spice grinder or mortar and pestle, grind together the garlic, red pepper flakes and fennel seeds. Mix with the chopped marjoram and thyme, salt and pepper. 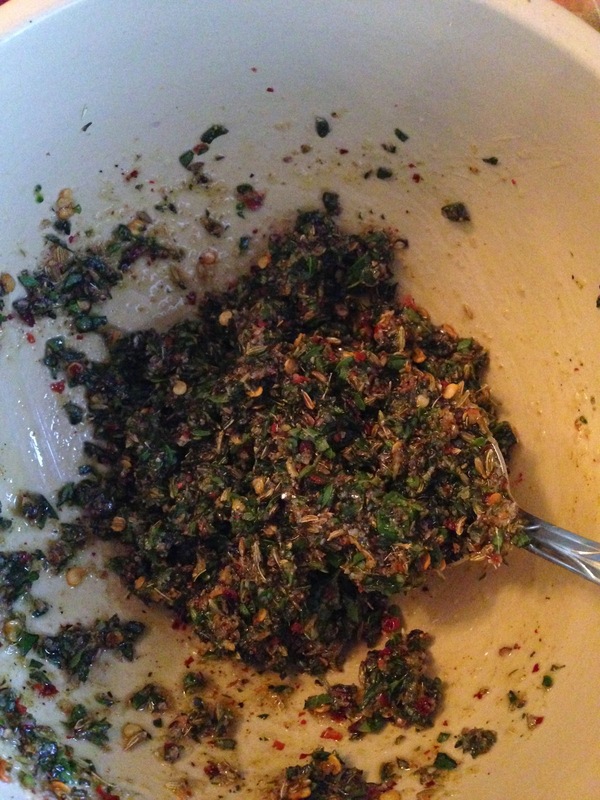 Mix with the 6 tablespoons of olive oil until a paste is formed. Rinse the potatoes. Halve or quarter the potatoes, depending on the size, then slice down along the top to the center of the potato, 3-4 cuts on each. This allows olive oil and flavor to soak into the flesh of the potatoes. 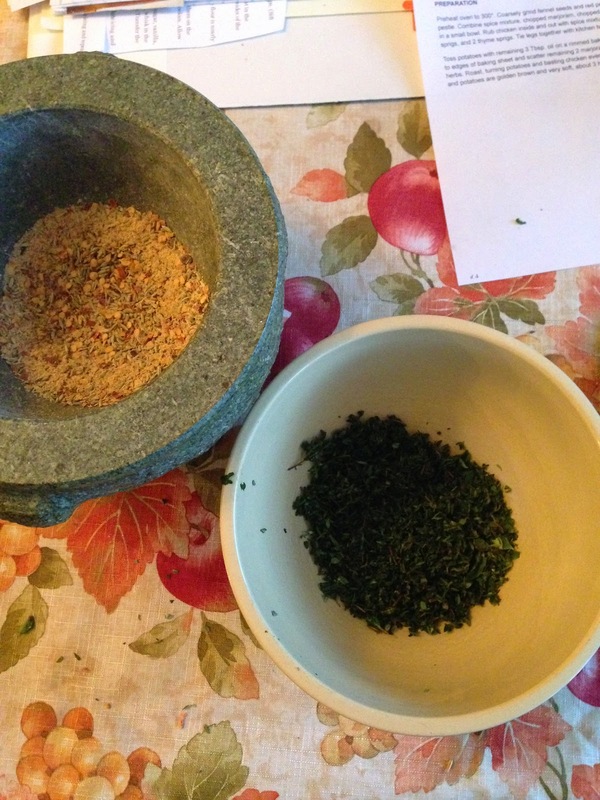 Divide the herb paste in half, and take one half and rub the spices all over the potatoes. Let them sit in the herbs while you prep the chicken. Preheat the oven on convection bake for 300-325˚. Drizzle 1-2 tablespoons of oil along the bottom of a large pyrex pan. Drain the chicken from the brining solution after 1 hour of brining. Rinse the chicken inside and out, then pat dry with a paper towel. 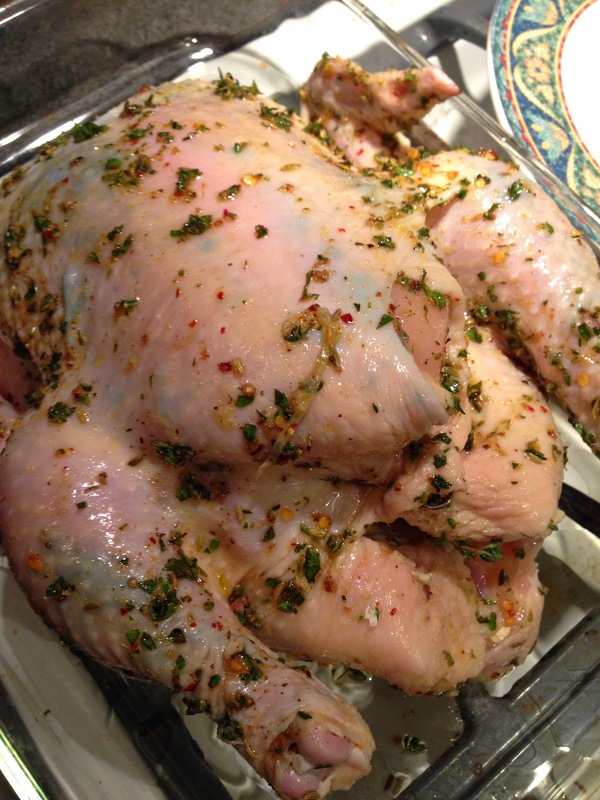 With the rest of the herb mix, rub the chicken inside the cavity, under the skin and outside the skin, top and bottom. 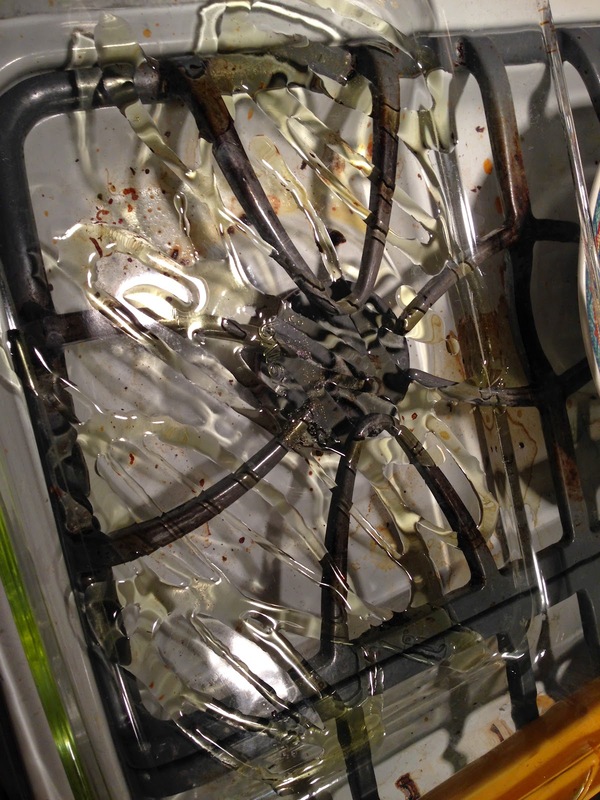 Place on the pyrex pan. Stuff the cavity with the garlic, lemon, thyme and marjoram sprigs. Cinch the cavity closed with trussing needles of toothpicks. I did not truss the legs. I preferred to let the chicken sit flatter in the pan for even cooking. Nestle the potatoes around the chicken in the pan. 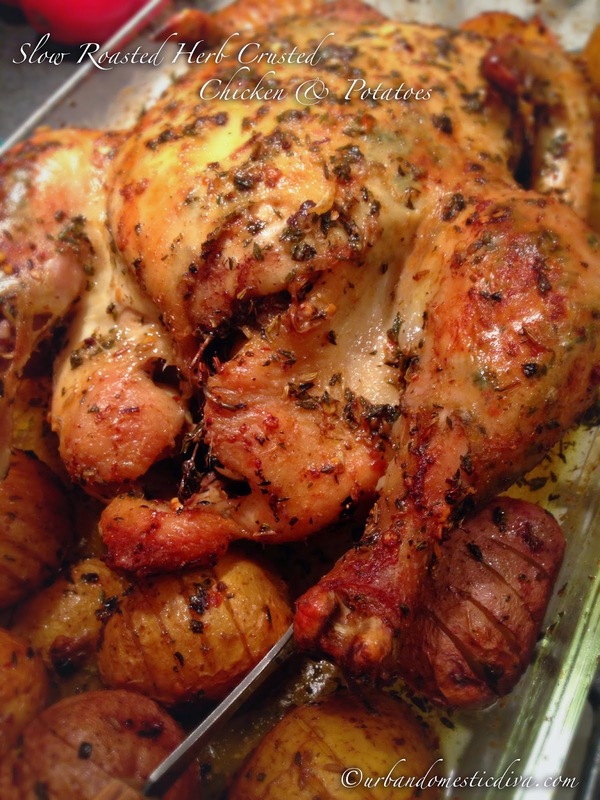 Rub any left over herb paste on the potatoes and chicken. Roast in the center of the oven. After the first hour, flip the bird, breast side down. Roast for another hour. Then the last hour, flip the bird right side up. 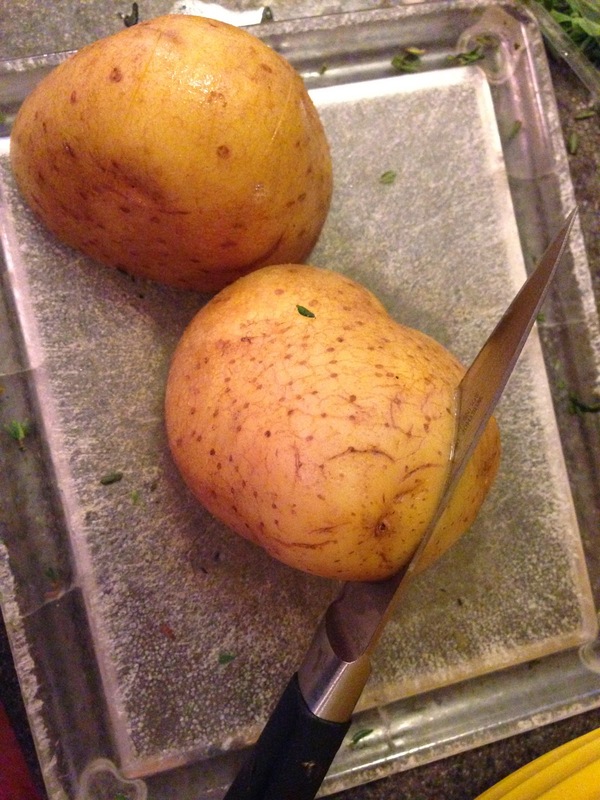 Baste often with pan juices and keep basting and turning the potatoes. 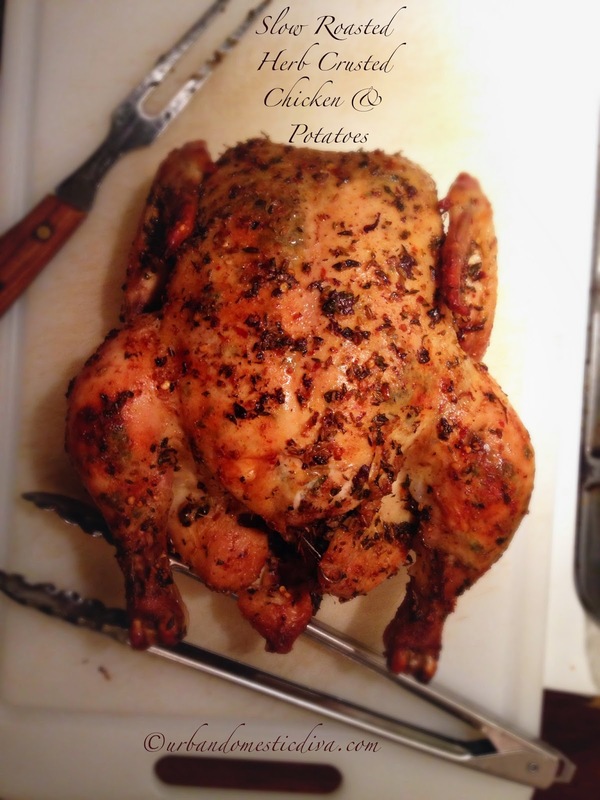 Roast until the thickest part of the breast/thigh area reads 165-170˚ on a meat thermometer. Let rest 10 minutes on cutting board before carving. The chicken should take 2 1/2-3 hours. 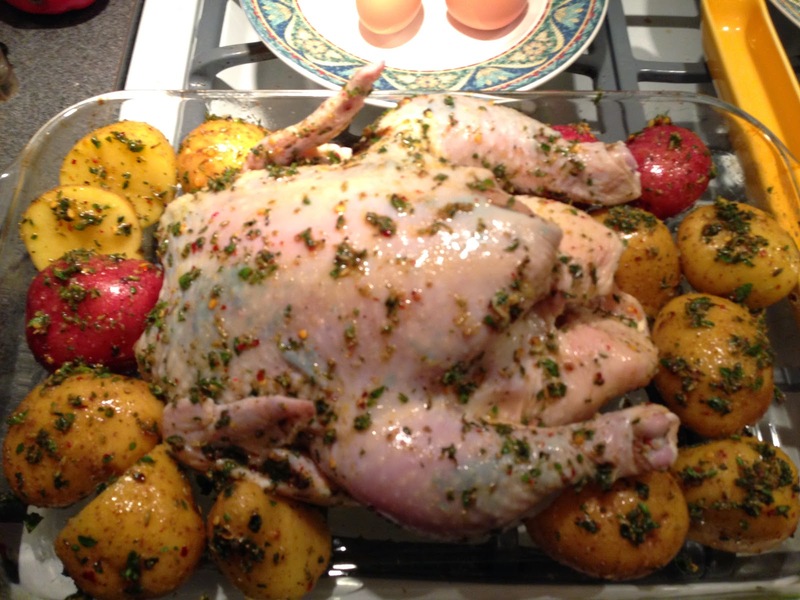 While the chicken is resting, pull the potatoes out and cover loosely to keep warm. Drain the pan juices and separate the fat and discard. Heat the juices in a saucepan to a simmer. Meanwhile, heat the chicken broth and add it to the saucepan, reserving a couple tablespoons of broth in a small ramekin. In that ramekin, mix in the corn starch until smooth and dissolved. Simmer the liquid in the saucepan for 10 minutes, reducing it slightly. Then add the corn starch mixture, and simmer until it's thickened. Serve the gravy with the carved chicken and potatoes.